It is getting colder in Chicago, but still nice. I received the Sefer Sholem Yershalim and we will have our Shiur at Kins this Sunday night at 8:45 PM. What does the Hebrew word, יְדַעְתִּיו , mean and how is it translated. The plain meaning is “to know”. The Bible and common usage is that the phrase “to know” as something more intimate, something about the nature of a person, I know his or her attributes greatness, etc. What does the Hebrew word לְמַעַן mean. It means either 1) for the sake of, in order to or 2) because of. Onklys and the Rishonim translate as follows. This is the standard translation in Klal Yisraol. I have chosen Avrohom because I know that he will command his children. 2) Rashi – I know him – I love him. For I have known him: Heb. יְדַעְתִּיו, an expression of love, like (Ruth 2:1) “a kinsman (מוֹדַע) of her husband”; (ibid. 3:2) “And now, Boaz our kinsman (מֹדַעְתָּנוּ)”; (Exod. 33:17): “and I shall know you (וָאֵדָעֲךָ) by name.” But, in fact, the primary meaning of them all is none other than an expression of knowing, for if one loves a person, he draws him near to himself and knows him and is familiar with him. Now why do I love him? “Because he commands” … for he commands his sons concerning Me, to keep My ways. But if you explain it as the Targum renders: “I know about him that he will command his sons, etc.,” the word לְמַעַן does not fit into the sense [of the verse]. 4) Ranban, Pshat #2 – See Rabanu Bachyaa. See Rabbi Zalman Sorotzkin for his explanation in the Oznayim LaTorah. See Professor Nechama Lebowitz, page 167 for her explanation. 4) Rabbi Hertz – “For I have known him, to the end that he may command his children”. Footnote: for I have known him. i.e. regarded and chosen him. I think Rabbi Hertz is based on Onklys. Rabbi Hertz says, “for I have known him. i.e. regarded and chosen him.” As I said before this is the standard explanation the Jews have used for years. 5) The Pentateuch, by Rabbi Samson Raphael Hirsch, “For I have given him My special Care so that he will command his children”. Reb Samson Raphael Hirsch’s translation of לְמַעַן – “so that he will” is problematic. It seems that God gave Avrohom “special Care” so that Avrohom will be able to properly teach his kids. It is almost Shabbos and it is snowing here in Chicago. It gives Shabbos a special look and feel. I wanted to send everyone the above Bible thought from the Kotzker Rebbe on this week’s portion. At the end of last week’s Bible portion and the beginning of this week’s Bible portion, there is an exchange between Moshe and God. Moshe challenged God and said that you God, sent me to free the Jewish people, not only did I fail, but their servitude got worse. God has to defend himself and say that indeed I will redeem the Jewish people. The Medresh Rabbah says on this exchange: “God said to Moshe – woe on what we have lost and are not found, that Moshe . . .” I do not have the full text of the Medresh here at work. 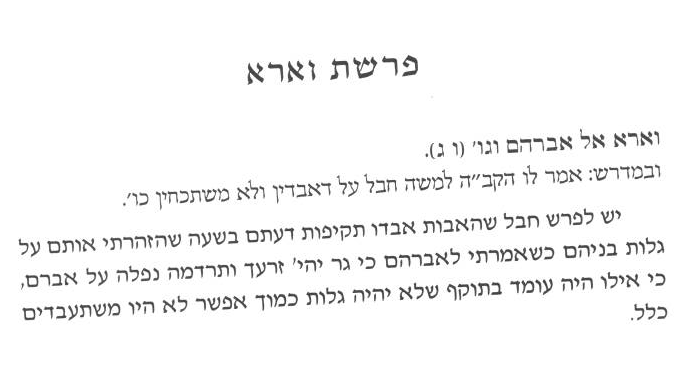 The Kotzker is saying the God is saying this, lamenting the inability for Avrohom to defend his own children. This is consistent with the Kotzker. I spoke to Dr. Ungar and he told me that this is the Chiddush, the mindset, of the school of Pshisca, The Yid Hakodash, the Rebbe Reb Bunim, and to the Kotzker, to challenge God. He said that there is a Talmud in Gitten that talks about this very subject, and of our forefathers, only Isaac stands up to God. The Bardichiver’s approach was to defend Jews to God in a sweet, cajoling manner, C’mon God, be good to your kids, the Jews are good, do not punish them. The Kotzker and his teachers, the school of Pshisca, was more brazen, upfront, and challenging God. This is what Moshe did in our Torah portion. I quickly wrote this so I apologize for sloppy wording.